Read about how to ship hazardous materials. The required training certification course for shipping biological materials and dry ice is now offered online through UC Learning. This self-paced course replaces the in-person training that could only be offered once per quarter. To register for the online training and certification course log in to UC Learning and search for "Shipping Biological Substance and Dry Ice"
Avoid costly fines. Take steps to get certified today. Warning: Failure to comply with international and federal transportation regulations when shipping hazardous materials can result in civil penalties of $78,376 per occurrence, and criminal penalties may include up to 10 years of imprisonment in addition (49CFR 107.329-107.333). Don't move the shipment yourself. 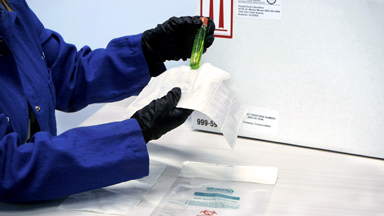 Shipping prepares all hazardous materials transport documents prior to the pick-up or movement of hazardous materials. This ensures that UCSD is in compliance to move the item across public roads to the Shipping Office on Trade Street. If you plan to ship hazardous materials, you should contact Shipping in advance and carefully follow the guidelines below. Exception: If you plan to ship radioactive materials, follow the instructions on How to Transfer Radioactive Materials. Note: It may take several days to complete the required paperwork if your shipment contains multiple hazardous materials. Give Shipping advance warning for such shipments, when possible. Required Training: Training and Certification is required for departments to ship Biological Substances/ Dry ice (49CFR 172.700). To register for the online training and certification course log in to UC Learning and search for "Shipping Biological Substance and Dry Ice". After you complete the course and pass the test you will be certified to ship Biological Substances and Dry Ice for 2 years. 1. Decide if your shipment is considered hazardous, and determine the type of hazard. See Safety Data Sheet (SDS) Overview to specifically identify your shipment. Shipping may ask you to fax the SDS describing your shipment, if one applies (see step 6). Even if an SDS does not apply, Shipping will ask for specific information to identify the hazard class of the item(s). 2. Fill out a Shipping Memo form. If you need a form, order it from Imprints, (858) 534-3020. To complete the form, follow the step-by-step instructions on How to Complete a Shipping Memo. If your shipment will be returned to the United States, list the approximate date. International shipments require the following anti-diversion statement on the Shipping Memo: "These commodities, technology, or software were exported from the United States in accordance with the Export Administration Regulations. Diversion contrary to U.S. law is prohibited." Note: If your international shipment consists of multiple packages, complete an International Shipment Summary and attach it to the Shipping Memo. Also follow step 2(d), below. Mark each package with running-total numbers such as "1 of 3". List each package number on the Shipping Memo. List the contents of each package separately. Keep the pink copy of the Shipping Memo for your records. Use the remaining copies in step 6. 3. Fax the Shipping Memo. Immediately follow up with a phone call to Shipping (step 4). 4. Call Shipping to confirm receipt of fax and to provide additional information. Call Shipping at (858) 534-5737 to confirm receipt of the fax. This is your responsibility. What is the hazardous material? What is the proper shipping name? What is the weight in grams/ capacity in liters? Shipping will assist you if additional documentation is required. Some items may require that you fax a Safety Data Sheet (SDS) to the Shipping Coordinator. Note: Shipping will pick up dry ice and priority hazardous materials by noon the day after you call, and we will ship that same day. 5. Obtain insurance, if needed. To determine your insurance needs and obtain insurance, see Transit Insurance. If you will need underwritten insurance, obtain required approval before proceeding further. If you have insurance questions, contact Kathleen Johnson, (858) 246-0369. Note: Domestic shipments valued under $100,000 are automatically insured if you can verify the shipment value. See Transit Insurance for details. Follow the instructions given by the Shipping Coordinator. Put the Shipping Memo (except for the pink copy, which you retain for your records) in an envelope marked "Shipping — HAZ MAT" and tape it to the package. 7. Give the package to the driver. The driver will place all proper documents, labels and markings required for transport on your package and deliver it to the Shipping Coordinator. Note: Only Shipping can pick up your package, not Mail Services. 8. Track your package and check shipping charges. After Shipping processes your package, they will mail the yellow copy of the Shipping Memo to you. This copy will contain carrier information and tracking numbers for future reference. Refer to it to check your shipping charges.